7 piece party platter but what kind???? This is a complete 7-piece Party Platter with beautiful Asian Themed paintings. It is in amazing wonderful condition. 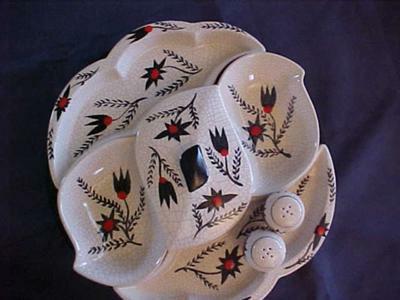 Painted so elegantly, with colors so pretty to have on your dinner table. All the porcelain pieces make a circle and fit on top of a wood (Painted glossy black) Lazy Susan so everyone at the table can reach each bowl. The center is a three sectioned piece with a lid that fits over any section. 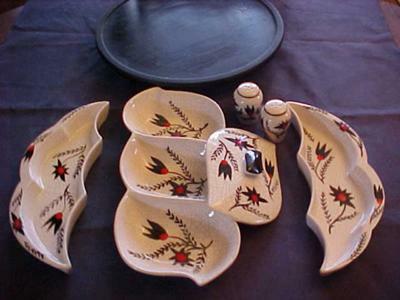 On each side of the middle piece are bowls. There is also matching salt and pepper shakers. 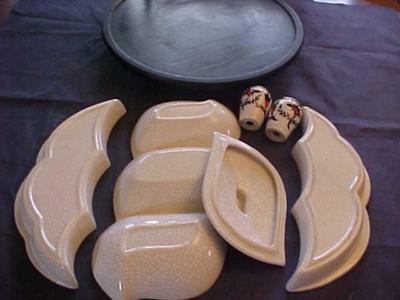 All porcelain pieces are painted white with a gray cracked eggshell type pattern in the background. 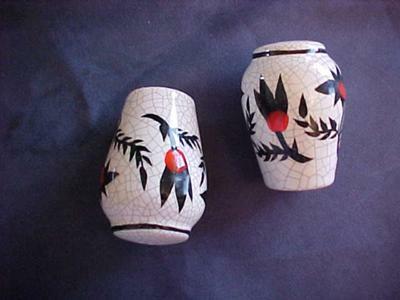 There are beautiful black flowers with red circle centers and stems with leaves all around the pieces. With the black Lazy Susan it looks very elegant. I just have no idea exactly what kind of party platter it is.Is it meant for Sushi? Or Japanese Or Chinese Foods? Comments for 7 piece party platter but what kind???? No idea what this is, but it looks neither Japanese nor Chinese.